Are you looking for a lock that can be opened without a key? If so, you're in the right place! 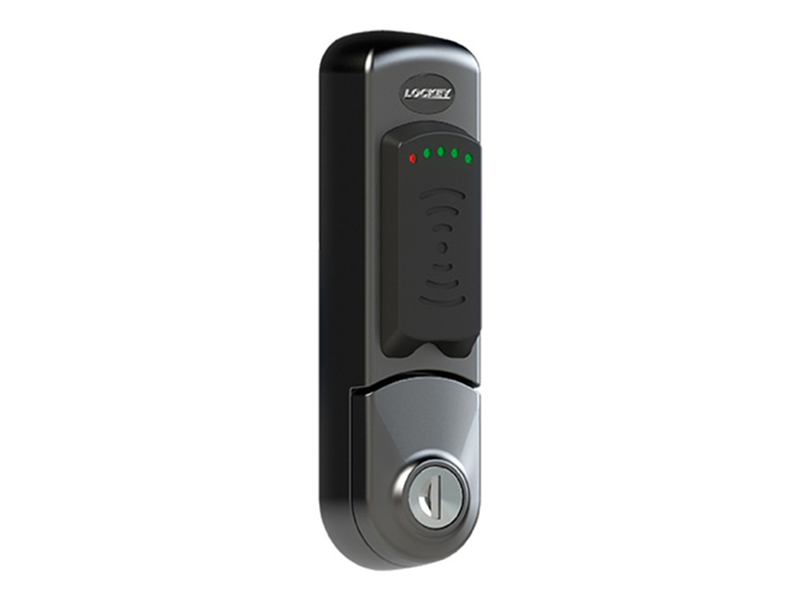 KeylessEntryLocks is the original source for some of the best keyless locks in the business. 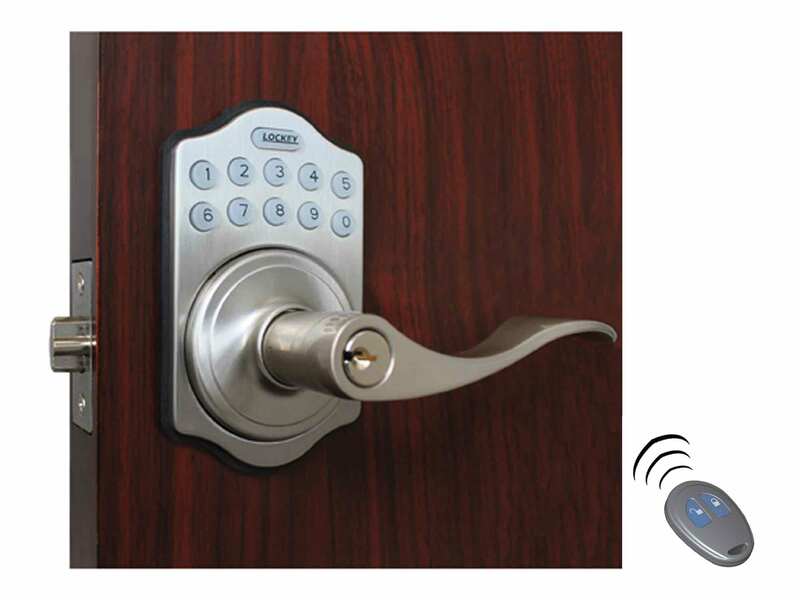 We carry a wide selection of locks that can be opened with a combination, WiFi, Bluetooth, Proximity Card, SmartPhone, key fob, or even your fingerprint. 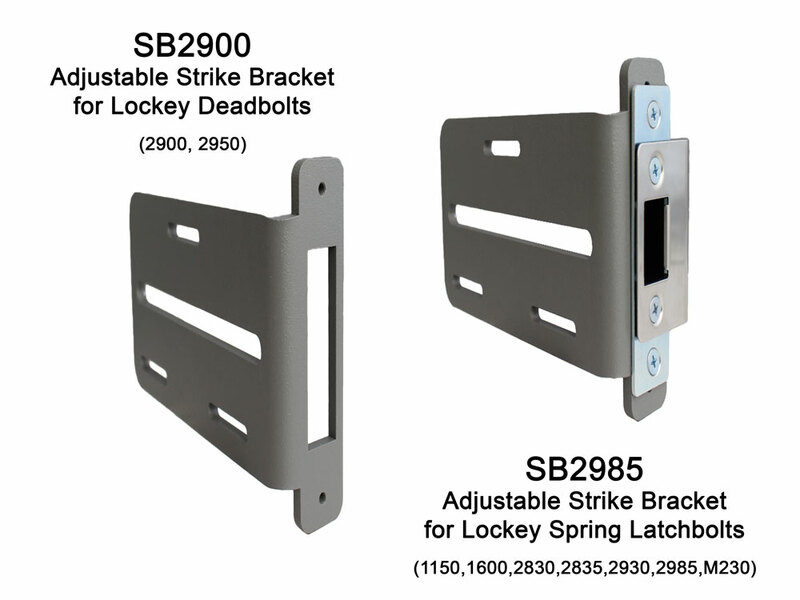 These locks are designed for your home, office, rental unit, storefront, pool gate, car, truck, or even RV. Need help choosing a lock? How to Choose a Lock is a handy guide that will step you through the process. This is especially handy if you know what you want, but you don't know how to describe it. Lock Comparison Table will show you a table of popular lock features so you can easily identify which locks have the features you want. The table makes it easy to compare the differences between lock models. We've got great products, prices, and customer service! Need proof? Check out some of our Customer Reviews. I have had the touchpad deadbolt Keyless Entry lock on my shed door for thirty years and it has always functioned beautifully. Over the past winter we had some trouble with it (we thought). With the very capable and friendly help of Sandy, we chose to purchase the same lock with plans to replace the old one. However with the Spring thaw, suddenly the lock seemed to be fine. The issue may be related to the door itself! We plan to keep the new one with a finish that we like better, trusting that the new one will also last for thirty years. There are not many devices that can offer that any longer! It is a wonderful product. Thank you for manufacturing your locks at such a high quality! Please let us know what you think, too! We'd love to see pictures of your new lock once it is installed and hear how it went. Looking for a lock that is more secure? 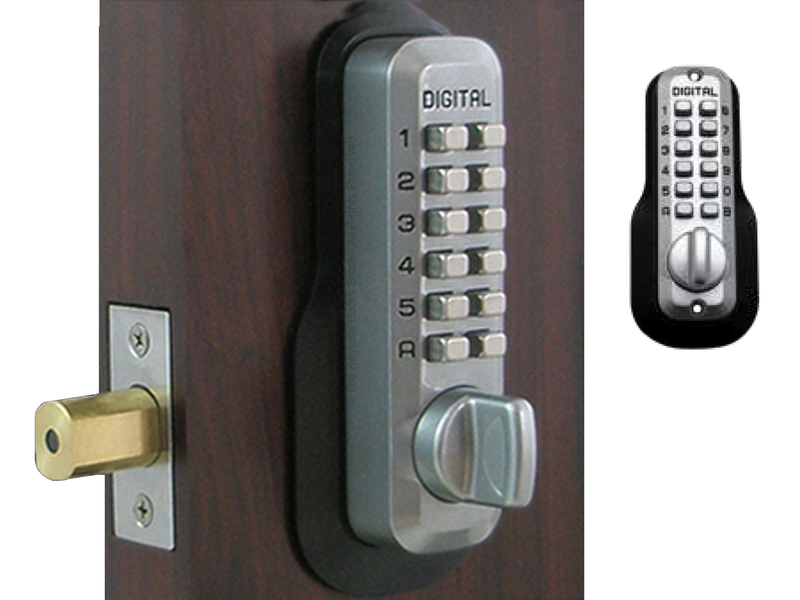 Our keyless door locks are more secure than traditional keyed locks. They can't be picked or bumped because they do not have a keyhole. And, our deadbolts and latch bolts are hacksaw-proof, too. Want convenience, quality, & affordability? 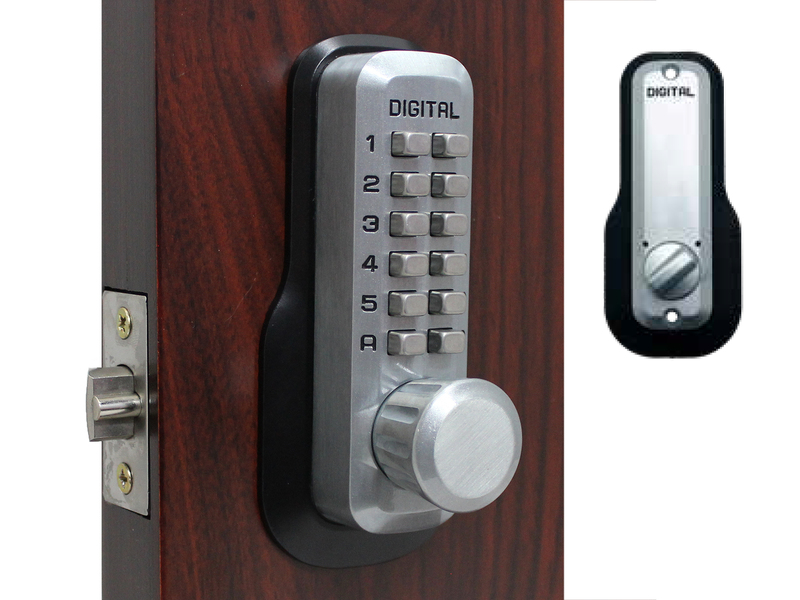 Our keypad push button locks can be opened with a secret code, so you don't have to carry around a key that could be lost, stolen, or copied. 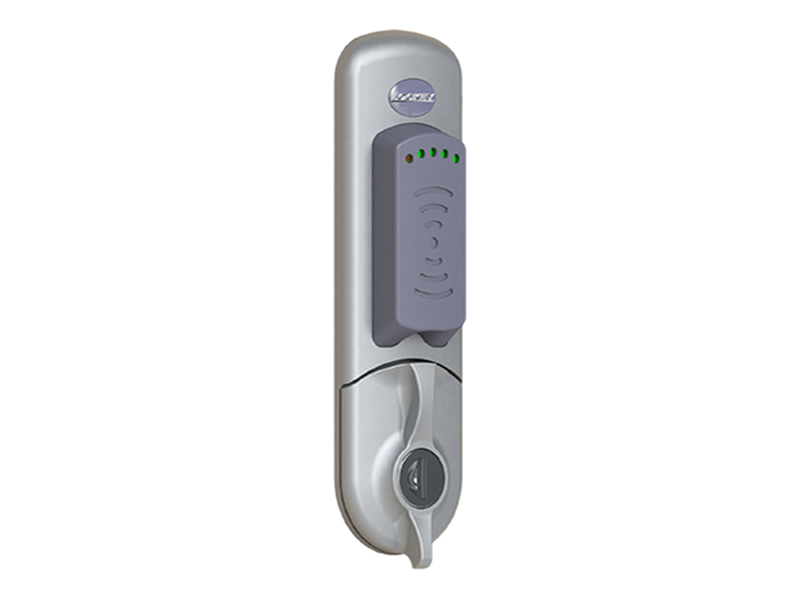 Some of our locks can also be opened with a key-chain fob, proximity card, a fingerprint or even remotely with a SmartPhone, tablet, or desktop PC using the WiFi router in your building. Most of our keyless mechanical locks come with a Life-Time Warranty and prices start at around $50 to $100 depending on the model you choose. We even have a 100% Customer Satisfaction Guarantee so you can return your order for up to 30-days. Need a weatherproof lock for a pool or garden gate? We have a full line of single or double-sided locks that can take any kind of weather, including tough salt-water conditions. And we've got a selection of gate boxes to make installation easier as well as gate closers for small to heavy gates to prevent unnecessary damage to your lock while making sure they close and lock each time they are used. Need to secure a business? Gotcha covered there, too! Whether you have one employee or 30,000, a single door or a double door made of solid wood, metal or glass, we have a wide variety of smart locks to choose from. Some can automatically unlock/re-lock at certain times and day. Others can keep an audit trail of when they were opened and by whom. Have a rental unit you need to control remotely? No problem! We have RemoteLocks that are specifically designed for VRBO/Airbnb. With these products, you can change the codes from your PC or Smartphone, automatically send it to your guests, lock or unlock your doors, even get alerts if you want when they use their code. All via WiFi from the Cloud. Control with your cell phone, tablet, or desktop computer. Also, available as a lever handle. What do you get when you buy from us? 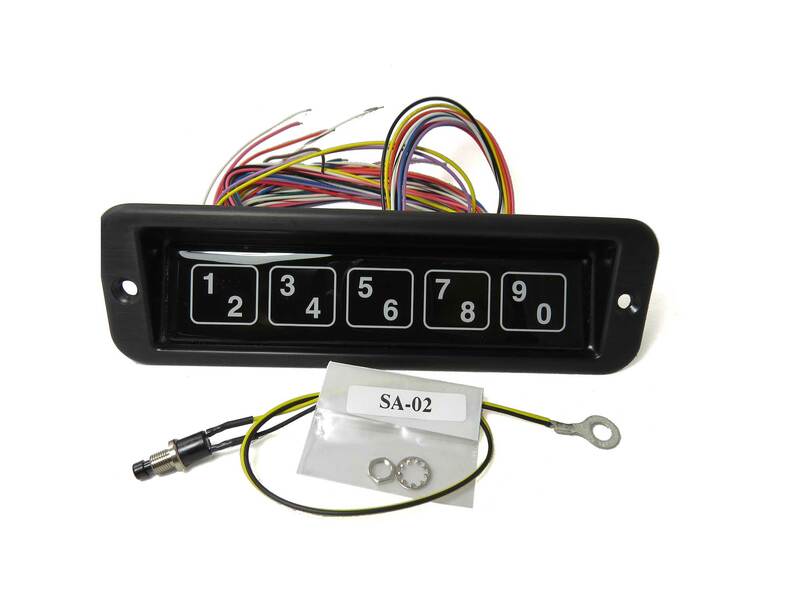 You get one of our trusted keyless locks and everything you need to install it on a standard door: the inside and outside lock bodies, the rubber trim plates, the strike plate kit, the deadbolt or latch bolt, the spindle, support pins, centering pins, and of course, all the screws you need. Have an unusually thick or thin door? We have Thick Door Kits (Extension Kits) for most of our Lockey locks. These work on doors between 2" and 5" thick. We also have a Thin Door Kits for cabinet doors that are between 1/4" to 7/8" thick. What kind of locks do we carry? Push-button keypad combination locks are unpickable & unbumpable. Your code can be as long or as short as you want! No keys to lose, have stolen, or copied. No wires to run. No batteries to change. No computer programming. Quick, easy-to-change combination. 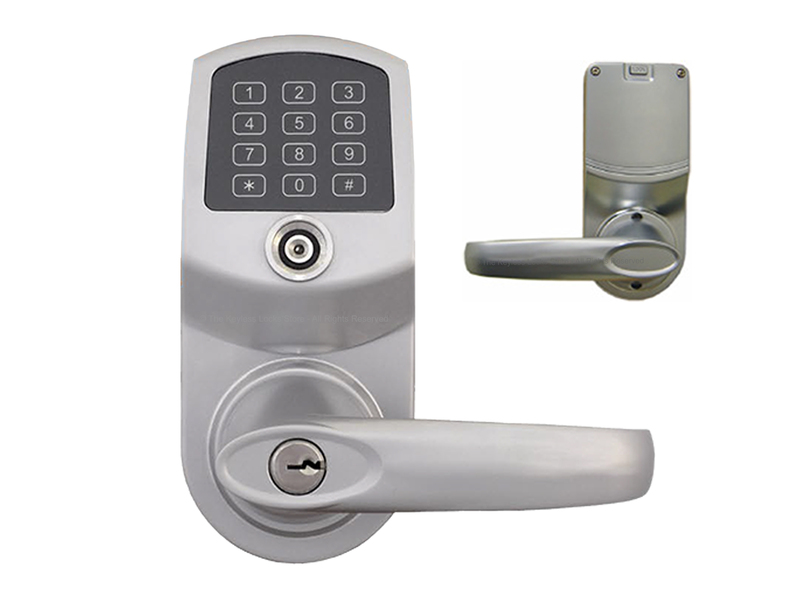 No keyhole means these keypad push button locks are pick-proof and bump-proof. The lock bolt is hacksaw-proof. The outside knob spins freely under heavy torque which protects the mechanism to prevent forced entry. 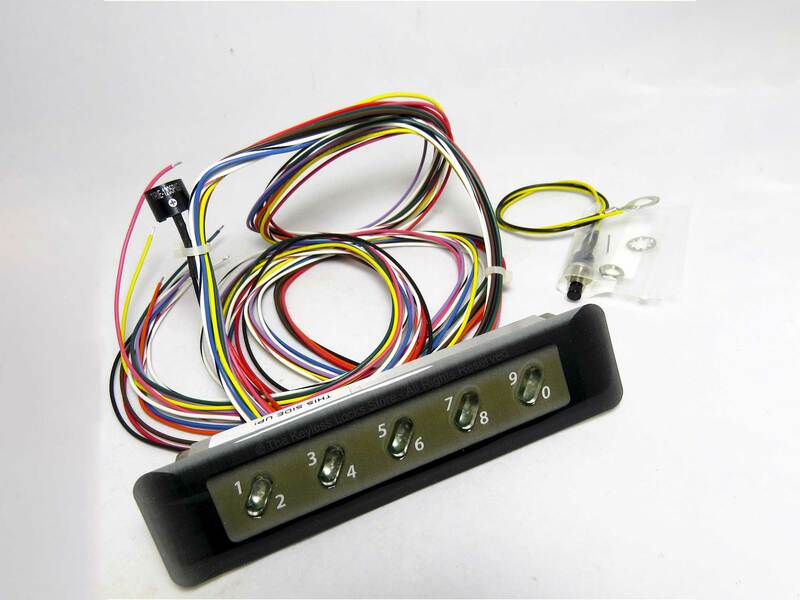 Our Lockey product line of push button keypad locks is totally mechanical and completely non-electric. No wires or batteries. 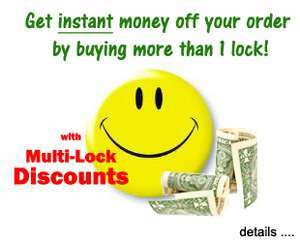 This is why these locks have a Lifetime Warranty along with an unconditional 100% Customer Satisfaction Guarantee. 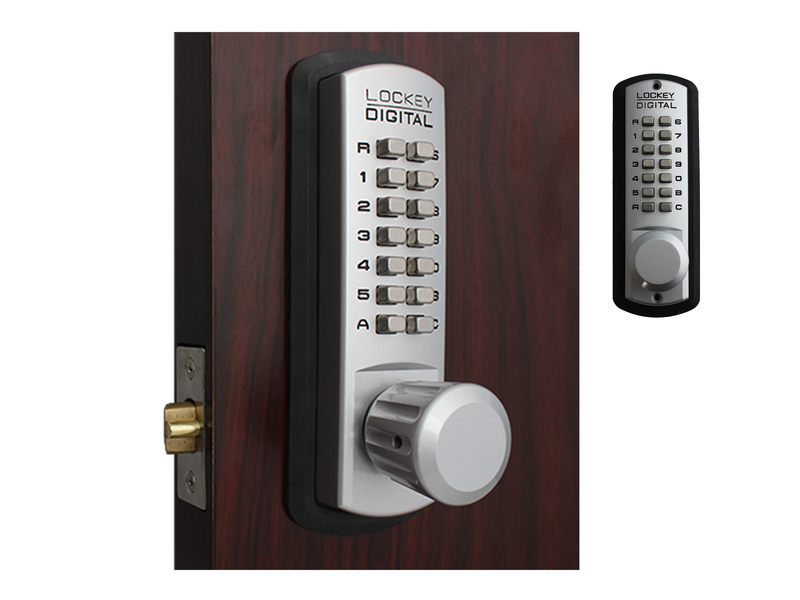 Lockey mechanical locks install in just minutes. (view installation instructions). They are simple, fast, and easy to operate. (see for yourself with our online demos). You can set any combination of 1 to 5 letters and/or numbers and change it quickly, whenever you want. (view instructions on changing the code). 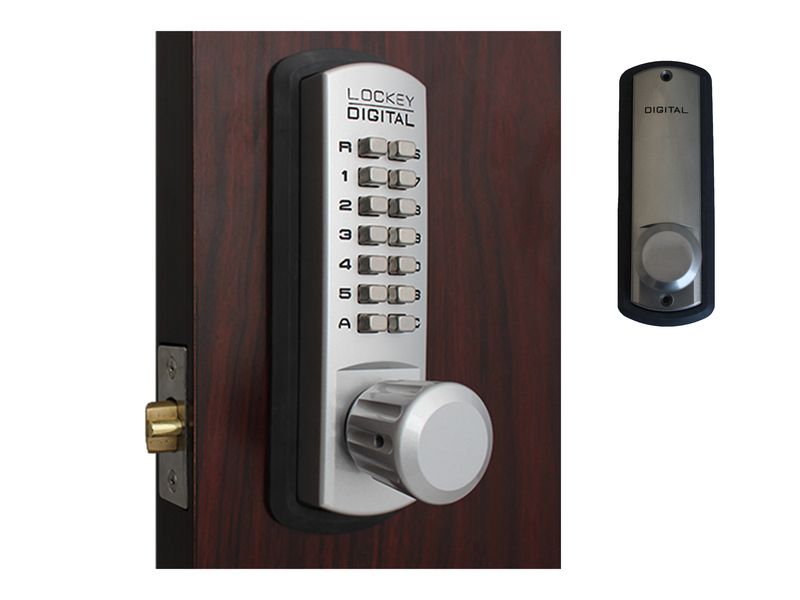 Our Lockey mechanical locks come in many beautiful finishes to complement a luxury home, modern office, or stylish garden gate or pool. To see them side by side, just click on Colors at the top.